Exilis Ultra Tightens Skin, Melts away Fat & Reduces Cellulite. The first and only non-invasive treatment to combine radio frequency and ultrasound can tighten and tone your whole body! Exilis Ultra is the best device available today to tighten sagging skin on the face and body and tighten and reduce fat and cellulite anywhere all without discomfort. 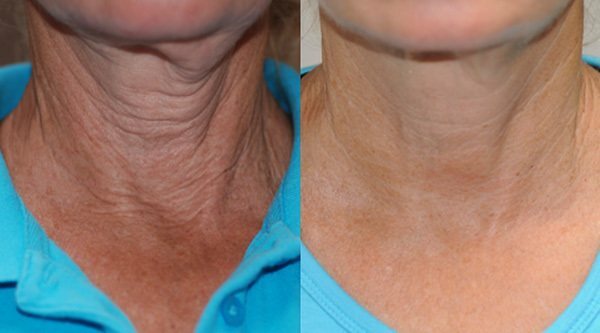 Now even lax, crepy skin can be treated utilizing Exilis with noticeable and lasting results. Body contouring and sculpting are also accomplished with a special body handpiece specifically designed to reduce fat and improve the appearance of cellulite. Radiofrequency energy with ultrasound penetrates into the skin, causing contraction, tightening and stimulation of new collagen over time. The result is tighter, firmer, younger appearing skin. Exilis Ultra works to better define facial and jawline features, as well as smoothing and sculpting of unsightly bulges and wrinkles on the body. This treatment is safe in all skin types and has no downtime. It is FDA-cleared for non-invasive treatment of wrinkles and reduction of the appearance of cellulite! The best skin tightening and body shaping technology is the Exilis Ultra! It’s only available at New Radiance Cosmetic Centers! BTL Exilis Ultra is a skin tightening and body sculpting treatment that is non-invasive, virtually painless and provides jaw-dropping results. This is the only body sculpting technology that combines the powers of radio frequency and ultrasound technology to tighten skin, enhance collagen production and kill fat cells. With the Exilis Ultra 360 you can look amazing from all angles with unmatched skin tightening, body sculpting, and fat reduction. Exilis Ultra™ quickly and evenly heats your skin and dermis with advanced ultrasound and radio frequency energy. This stimulates your body’s collagen and elastin production and rejuvenates treated areas. It tightens skin and also destroys fat cells for complete body sculpting. With Exilis Ultra, you get total body transformation with skin tightening, fat, and cellulite reduction! Results can be seen after 1 Exilis Ultra treatment but this depends on the area treated and the results desired. Most patients get 4 treatments 7-10 days apart. The recommended number of body treatments is between 4 to 6 sessions. For laxity (skin tightening) the recommended number of treatments is 4 sessions but with lessor laxity 2 treatments may suffice.. Treatments are typically scheduled on a weekly basis but either can be spaced further apart as the results are cumulative. ULTRA TECHNOLOGY – The industry’s only non-invasive device to deliver radio frequency and ultrasound simultaneously. ULTRA SAFE – No needles or anesthesia, comparable to a hot stone massage, no downtime. ULTRA SCIENCE – Clinical studies have demonstrated that Exilis Ultra produces skin tightening and apoptosis (death) of fat cells. These together are the perfect therapy for body sculpting, skin tightening and circumferential reduction. Exilis Face Treatments also available! Exilis Ultra™ is the most advanced, full-body, non-surgical skin tightening, fat busting and tissue lifting procedure available. In our Palm Beach Gardens Cosmetic Center, you can achieve these results* with virtually no discomfort and absolutely no surgery! SEE BEFORE & AFTERS IN VIDEO BELOW! Exilis Ultra is the most advanced FDA cleared1 device for non-surgical body sculpting and skin tightening. Tightens Skin, Sculpts Body & Reduces Fat. Treats and improves anywhere on body and face! Two different handpieces so we can target skin or deep tissue with gentle RF and ultrasound waves to tighten and remodel tissues. 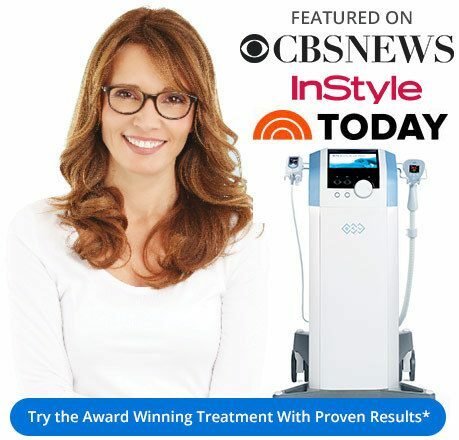 Is there any recovery or downtime with Exilis treatment? No. The Exilis Ultra treatment is pain-free. Patients return to daily activities immediately following treatment. Some redness may be experienced which will disappear within 1-2 hours. For body treatments, you can exercise the same day. For facial treatments, you can apply makeup later the same day. No. Treatment is well tolerated. It has been compared to a hot stone massage. During a session, a hand piece is guided over the treatment area. Patients feel a warming sensation as the heat energy is delivered. The device engages the cooling system to protect the upper skin layers. It constantly monitors the skin’s temperature. Together, the deep heating and superficial cooling make for a comfortable, even treatment, avoiding the extreme hot or intensely cold spots. The Exilis Ultra uses ultrasound and radio frequency energy. This promote contraction in the collagen fibers and causes the body to rapidly reproduce significantly more collagen. This results in a tighter, smoother look and feel to the skin. The heat that penetrates through the fat tissue can shrink fat cells. This can sculpt and slim the body’s silhouette. Over the course of treatments, the skin tightens and the overall thickness of the fat layer decreases. Exilis Ultra also contains a cooling portion. The safe transmission of radio-frequency allows it to cool the epidermis and prevent surface damage. This still disrupts fat cells as desired. The cooling factor of Exilis makes it safe for use upon any part of the body for skin tightening or body contouring. The Exilis treatment is pain-free. Patients return to their daily activities immediately following treatment. Please get very hydrated – drink lots of fluids. Avoid alcohol and coffee before treatment. If you are getting a face treatment, please do not wear makeup the day of your treatment. Do not shave in any treatment area 1 day before procedure. This depends on the area treated and the results desired. Most patients get 4 treatments 7-10 days apart. The recommended number of body treatments is between 4 to 6 sessions. For laxity (skin tightening) the recommended number of treatments is 4 sessions. Treatments are typically scheduled on a weekly basis but either can be spaced further apart as the results are cumulative. Absolutely. Exilis is safe and effective for all skin tones. It does not rely on skin pigment targeting. Can I use Exilis where I have had dermal fillers or neurotoxins? Yes. Exilis Ultra may be used in areas treated with dermal fillers and neuromodulators.